The memorable moments from day one. The first day of Pro Championships is in the books. Here are four moments we saw that defined the first four rounds of pool play. The first half between the top two teams of Pool B was largely even. #5 Washington DC Scandal led two breaks to one, and 8-6 on the scoreboard, but #8 Atlanta Ozone were still very much in the game at the intermission. On the first point of the second half, Ozone underthrew two hucks, and lost the defensive deep space to Scandal the other way. Lauren Allen tossed a forehand to Amy Zhou at the back line, a continuation of DC’s dominance in the deep lanes during the game. Scandal got the break to take a 9-6 lead, but more consequentially, it started a three break run for the District. Ozone had two more turns on hucks as they continued to struggle in that phase of their offense. The three point break run capped off a four point run altogether, with their hold to take halftime, and opened up an 11-6 lead that Ozone could not surmount. #1 Boston Brute Squad’s 15-5 final score over #3 Madison Heist is pretty indicative of a complete performance from Brute Squad. But even that score was closer than the game really was. Brute seriously flirted with getting the shutout, getting out to an 11-0 lead before Heist were finally able to score. To get so close to shutting out a regular Nationals attendee was stunning, but Brute Squad were untested in all of their games on Saturday. They beat Bay Area FAB 15-2 and Toronto 6ixers 15-6. Before play began this weekend, Brute looked like heavy favorites to win. After Saturday, it seems like they may not even play in a close game. Heist and #19 Washington DC Grit played in one of the closest games of the day. Heist led by one break at half, up 8-7. But Grit were able to get the break back over the course of the second half thanks to their tough, physical brand of defense. They were able to force double game point at 12-12, giving themselves a chance to add another upset to their already impressive 2018 resume. Heist were able to work it down the field fairly easily to gain the red zone. But to get the score, they needed a big layout from Prucha, something she did several times throughout the game. The win preserved Heist’s opportunity to advance to the bracket, and demonstrated an improved ability to win games through adversity from when we saw them last at Elite-Select Invite. 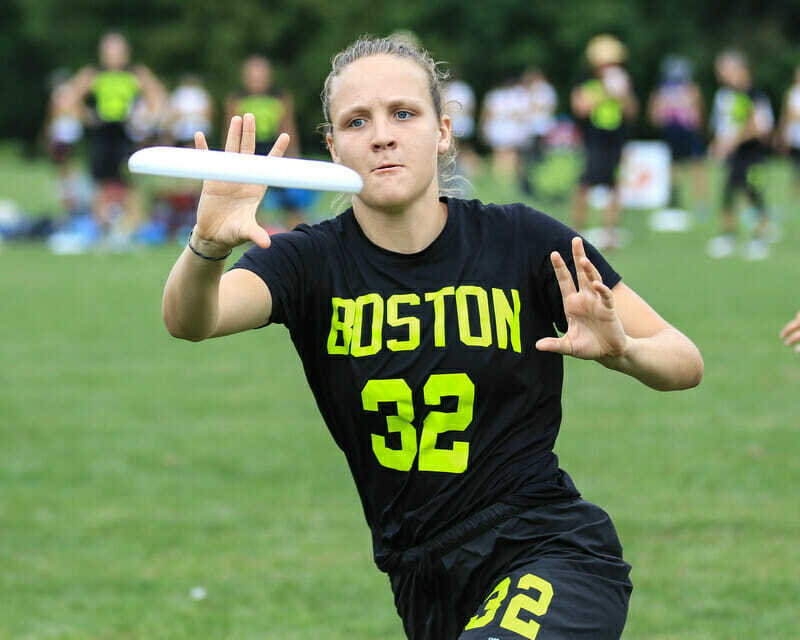 Comments on "Pro Championships 2018: Moments That Defined Saturday (Women’s)"